They are a problem in Ajax! I have 2 young children, use to have 4 cats however one got out and never came home. Not at a shelter not in the deceased database, as well as many other cats in this area he has mysteriously disappeared. 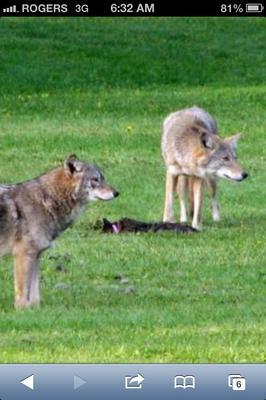 There is a pack of 6 Coyotes that live less than a 10 minute walk from my house by Nottingham in Ajax. They have been seen running down the street. I saw one at the gas station a couple of days ago and yesterday one darted across the road near the Ajax Community Center (where there are many children) chasing a squirrel. They frequent Rotary Park (another place many children play) where they were captured in a photograph eating somebody's cat wearing a pink collar, if that isn't a well enough sign that there isn't enough food for them here then I don't know what it is. Now because of these vicious creatures somebody has lost a pet, many people in fact, just one was caught in a picture. Unfortunately, these, as you stated, intelligent creatures will end up viciously attacking a small child before something is done about it, as I said there clearly is not enough food for them they WILL attack humans when they are starving. Until this problem is taken care of people, pets and our wildlife are in grave danger at the quickly increasing population of these vicious animals. I know it must be such a worry when there are so many of them around. I think the Nottingham area of Ajax has several Golf Courses in the area, I counted five, and Conservation Areas as well, and cute wildlife (which we like) and Coyotes (which we don't like) have lived in the green spaces for many years. I don't know about Ajax, but many Canadian cities are growing and spreading into what was, until recently, rural areas, and the wildlife either dies out or learns to exist around humans, and unfortunately, Coyotes have learned to exist with us and have found that we provide sources of easy food (our pets). I too, hope there is no danger to small children, but I'm not sure what the answer is, although teaching children what to do if they see a Coyote is a good place to start - they shouldn't run away as that can trigger any canid to chase, rather they should slowly walk away and tell an adult (there should be one around anyway). Comments for They are a problem in Ajax! I totally get that Coyotes are growing in population, but they are very smart animals and will breed more in order to keep their species going. Unfortunately it is the building of new houses in what used to be their home that is forcing them to look for food in cities. People should be keeping their pets (cats) indoors and not roaming the streets. I watched a program that said it is nearly impossible to control their population because of their intelligence. We need to learn to live with the wildlife who's homes we are destroying and understand they didn't ask to have to come to the cities to hunt for food, they had no other choice. Most are afraid of humans and they do help control the rabies population by eating the sick animals with rabies. Coyotes not afraid of humans probably need to be dealt with, but most will run the other way. Nowadays if you are buying a home where a forest once was, be prepared for visits from wildlife. I agree, it is not the wildlife which is coming closer to human habitation, it is we who are building our houses where they already live. Yes, they have always lived here but the problem everyone is failing to see is they are breeding and quickly growing to be a much larger group and spreading out across the town, their food source is depleted they are now wandering the streets in broad daylight when they are known for coming out a dusk, mark my words this summer a human will be attacked, there simply are too many of them in this small town and they are quickly running out of food. I hope the Municipality starts to deal with the situation before anyone is hurt.